Is it a war memorial? This photograph shows my grandfather, Alderman Horace Robbins, unveiling a Memorial Birdbath at Moulsecoomb Infants’ School. What the memorial was for I don’t know, but the photo appears to date from the late 1940s or early 1950s, so it may be a war memorial. 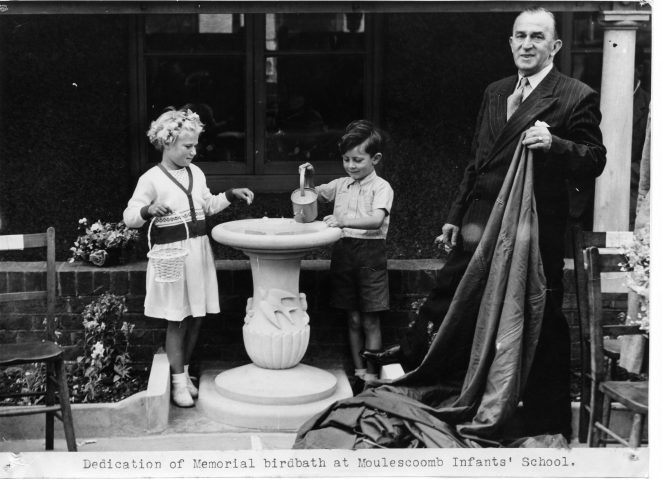 If anyone knows anything about the Memorial Birdbath, when it was unveiled, or who the children were in the photograph, I would love to know. Grandfather, who died before I was born, was born in Camberwell, London in 1889 but moved to Hove by 1891 with his widowed mother and two brothers. By 1901 he was living with his mother in Reigate Road, Preston, Brighton and continued to live there until after he was married in 1916. By 1929 he was living at 145 Ringmer Rd, Moulsecoomb and remained there until his death. A member of the National Union of Railwaymen, he was elected to Brighton Council as Labour councillor for Hanover Ward on 1 November 1934 with 725 votes. He remained a councillor and was chosen as Alderman for the King’s Cliff ward in July 1953. Whilst a councillor and Alderman, he was noted as a keen educationalist, addressing at least one teacher’s union conference. His remarks, as reported in the paper, still resonate today as they relate to class sizes, standards, and delinquency. He was also an active chairman of the Parks Committee and a member of the Watch Committee which was responsible for the Police and Fire services. Hi Geoff, I was a pupil in the infants school at the time if my memory serves me correctly. The bird bath was erected as a memorial to the Headmaster, following his death. His name may have been Kitchen although I am a bit foggy on that detail. Date? around 1949-50 I would suggest. Hi John, thanks for the comment. It hadn’t occurred to me that it may have been a memorial to a particular person. I have checked the Deaths indexes for that sort of era and can’t find many likely ‘Kitchen’ candidates – the closest was a 72 year old registered in Lewes, which sounds a bit old to me. I wonder if anyone else can add to your useful recollection. Hello (again) Geoff. Sorry, I did say I was a little foggy on the detail. Perhaps you can access records of a change of Headmaster/mistress for the Infants around 1949-51? You may get a clue from that! Regarding the headteacher of Moulsecoomb Infants School, I know that it was Miss Tidy. I started at the school in 1940 and I remember her well. In the Juniors the Headteacher was Mr. A. E. Kitchen, all my school reports have his signature on them. I think his name was Albert, at some time during my time at the school my mother was the school secretary. Hope this helps. Belatedly – better late than never . . . Hi John, Mr Kitchen was the headmaster at Moulsecoomb Junior Mixed School for many years and the headmistress of the infants school was Miss Tidy. My tales about the infants school are somewhere here nearby. I went to Moulsecoomb Infants School from 1961 to 1964; but as a 4 year old when I started I cannot remember seeing the birdbath at all. I suppose it is not the sort of thing someone of that age would be aware of. I would like to know though, is it still there? Has anyone got any recent photos of it and is it still in good condition? It looked fabulous in the 40s when it was put in and it would be good to know that it still stands and has not fallen by the wayside. I last went up to the school a few years ago and although the main building with the hall has not changed much, the old canteen that was on the eastern side of the infants playground has long gone. I also remember there being a small classroom next to the canteen on the southern side near the juniors where I was in the third year. That has gone as well but I remember it was always horrible on wet days as we had to go to assembly and we’d usually get soaked walking down to the hall. Mrs Anscombe was the headmistress then and my very first teacher was a Mrs Patterson in 1961.